1.2 Why use R for geocomputation? 6.3 Which CRS to use? 9.5 When to use what? 15.4 Where to go next? Spatial operations are a vital part of geocomputation. This chapter shows how spatial objects can be modified in a multitude of ways based on their location and shape. The content builds on the previous chapter because many spatial operations have a non-spatial (attribute) equivalent. This is especially true for vector operations: Section 3.2 on vector attribute manipulation provides the basis for understanding its spatial counterpart, namely spatial subsetting (covered in Section 4.2.1). Spatial joining (Section 4.2.3) and aggregation (Section 4.2.5) also have non-spatial counterparts, covered in the previous chapter. Spatial operations differ from non-spatial operations in some ways, however. To illustrate the point, imagine you are researching road safety. Spatial joins can be used to find road speed limits related with administrative zones, even when no zone ID is provided. But this raises the question: should the road completely fall inside a zone for its values to be joined? Or is simply crossing or being within a certain distance sufficient? When posing such questions, it becomes apparent that spatial operations differ substantially from attribute operations on data frames: the type of spatial relationship between objects must be considered. These are covered in Section 4.2.2, on topological relations. Another unique aspect of spatial objects is distance. All spatial objects are related through space and distance calculations, covered in Section 4.2.6, can be used to explore the strength of this relationship. Spatial operations also apply to raster objects. Spatial subsetting of raster objects is covered in Section 4.3.1; merging several raster ‘tiles’ into a single object is covered in Section 4.3.7. For many applications, the most important spatial operation on raster objects is map algebra, as we will see in Sections 4.3.2 to 4.3.6. Map algebra is also the prerequisite for distance calculations on rasters, a technique which is covered in Section 4.3.6. It is important to note that spatial operations that use two spatial objects rely on both objects having the same coordinate reference system, a topic that was introduced in Section 2.4 and which will be covered in more depth in Chapter 6. This section provides an overview of spatial operations on vector geographic data represented as simple features in the sf package before Section 4.3, which presents spatial methods using the raster package. Spatial subsetting is the process of selecting features of a spatial object based on whether or not they in some way relate in space to another object. It is analogous to attribute subsetting (covered in Section 3.2.1) and can be done with the base R square bracket ([) operator or with the filter() function from the tidyverse. Figure 4.1: Illustration of spatial subsetting with red triangles representing 101 high points in New Zealand, clustered near the central Canterbuy region (left). The points in Canterbury were created with the [ subsetting operator (highlighted in gray, right). Like attribute subsetting x[y, ] subsets features of a target x using the contents of a source object y. Instead of y being of class logical or integer — a vector of TRUE and FALSE values or whole numbers — for spatial subsetting it is another spatial (sf) object. Note the empty argument — denoted with , , — in the preceding code chunk is included to highlight op, the third argument in [ for sf objects. One can use this to change the subsetting operation in many ways. nz_height[canterbury, 2, op = st_disjoint], for example, returns the same rows but only includes the second attribute column (see sf:::`[.sf` and the ?sf for details). For many applications, this is all you’ll need to know about spatial subsetting for vector data. In this case, you can safely skip to Section 4.2.2. In the above code chunk, an object of class sgbp (a sparse geometry binary predicate, a list of length x in the spatial operation) is created and then converted into a logical vector sel_logical (containing only TRUE and FALSE values). The function lengths() identifies which features in nz_height intersect with any objects in y. In this case 1 is the greatest possible value but for more complex operations one could use the method to subset only features that intersect with, for example, 2 or more features from the source object. Note: another way to return a logical output is by setting sparse = FALSE (meaning ‘return a dense matrix not a sparse one’) in operators such as st_intersects(). The command st_intersects(x = nz_height, y = canterbury, sparse = FALSE)[, 1], for example, would return an output identical to sel_logical. Note: the solution involving sgbp objects is more generalisable though, as it works for many-to-many operations and has lower memory requirements. At this point, there are three versions of canterbury_height, one created with spatial subsetting directly and the other two via intermediary selection objects. To explore these objects and spatial subsetting in more detail, see the supplementary vignettes on subsetting and tidverse-pitfalls. Topological relations describe the spatial relationships between objects. To understand them, it helps to have some simple test data to work with. Figure 4.2 contains a polygon (a), a line (l) and some points (p), which are created in the code below. Figure 4.2: Points (p 1 to 4), line and polygon objects arranged to illustrate topological relations. The output is a matrix in which each row represents a feature in the target object and each column represents a feature in the selecting object. In this case, only the first two features in p intersect with a and there is only one feature in a so the result has only one column. The result can be used for subsetting as we saw in Section 4.2.1. Note that st_intersects() returns TRUE for the second feature in the object p even though it just touches the polygon a: intersects is a ‘catch-all’ topological operation which identifies many types of spatial relation. Functions for calculating topological relations use spatial indices to largely speed up spatial query performance. They achieve that using the Sort-Tile-Recursive (STR) algorithm. The st_join function, mentioned in the next section, also uses the spatial indexing. You can learn more at https://www.r-spatial.org/r/2017/06/22/spatial-index.html. Joining two non-spatial datasets relies on a shared ‘key’ variable, as described in Section 3.2.3. Spatial data joining applies the same concept, but instead relies on shared areas of geographic space (it is also know as spatial overlay). As with attribute data, joining adds a new column to the target object (the argument x in joining functions), from a source object (y). The scenario is illustrated in Figure 4.3. The random_points object (top left) has no attribute data, while the world (top right) does. The spatial join operation is done by st_join(), which adds the name_long variable to the points, resulting in random_joined which is illustrated in Figure 4.3 (bottom left — see 04-spatial-join.R). Before creating the joined dataset, we use spatial subsetting to create world_random, which contains only countries that contain random points, to verify the number of country names returned in the joined dataset should be four (see the top right panel of Figure 4.3). Figure 4.3: Illustration of a spatial join. A new attribute variable is added to random points (top left) from source world object (top right) resulting in the data represented in the final panel. By default, st_join() performs a left join (see Section 3.2.3), but it can also do inner joins by setting the argument left = FALSE. Like spatial subsetting, the default topological operator used by st_join() is st_intersects(). This can be changed with the join argument (see ?st_join for details). In the example above, we have added features of a polygon layer to a point layer. In other cases, we might want to join point attributes to a polygon layer. There might be occasions where more than one point falls inside one polygon. In such a case st_join() duplicates the polygon feature: it creates a new row for each match. Figure 4.4: The spatial distribution of cycle hire points in London based on official data (blue) and OpenStreetMap data (red). The result of this join has used a spatial operation to change the attribute data associated with simple features; the geometry associated with each feature has remained unchanged. Like attribute data aggregation, covered in Section 3.2.2, spatial data aggregation can be a way of condensing data. Aggregated data show some statistics about a variable (typically average or total) in relation to some kind of grouping variable. Section 3.2.2 demonstrated how aggregate() and group_by() %>% summarize() condense data based on attribute variables. This section demonstrates how the same functions work using spatial grouping variables. Figure 4.5: Average height of the top 101 high points across the regions of New Zealand. The resulting nz_avheight objects have the same geometry as the aggregating object nz but with a new column representing the mean average height of points within each region of New Zealand (other summary functions such as median() and sd() can be used in place of mean()). Note that regions containing no points have an associated elevation value of NA. For aggregating operations which also create new geometries, see Section 5.2.6. Spatial congruence is an important concept related to spatial aggregation. An aggregating object (which we will refer to as y) is congruent with the target object (x) if the two objects have shared borders. Often this is the case for administrative boundary data, whereby larger units — such as Middle Layer Super Output Areas (MSOAs) in the UK or districts in many other European countries — are composed of many smaller units. Incongruent aggregating objects, by contrast, do not share common borders with the target (Qiu, Zhang, and Zhou 2012). This is problematic for spatial aggregation (and other spatial operations) illustrated in Figure 4.6. Areal interpolation overcomes this issue by transferring values from one set of areal units to another. Algorithms developed for this task include area weighted and ‘pycnophylactic’ areal interpolation methods (Tobler 1979). Figure 4.6: Illustration of congruent (left) and incongruent (right) areal units with respect to larger aggregating zones (translucent blue borders). The spData package contains a dataset named incongruent (colored polygons with black borders in the right panel of Figure 4.6) and a dataset named aggregating_zones (the two polygons with the translucent blue border in the right panel of Figure 4.6). Let us assume that the value column of incongruent refers to the total regional income in million Euros. How can we transfer the values of the underlying nine spatial polygons into the two polygons of aggregating_zones? The simplest useful method for this is area weighted spatial interpolation. In this case values from the incongruent object are allocated to the aggregating_zones in proportion to area; the larger the spatial intersection between input and output features, the larger the corresponding value. For instance, if one intersection of incongruent and aggregating_zones is 1.5 km2 but the whole incongruent polygon in question has 2 km2 and a total income of 4 million Euros, then the target aggregating zone will obtain three quarters of the income, in this case 3 million Euros. This is implemented in st_interpolate_aw(), as demonstrated in the code chunk below. In our case it is meaningful to sum up the values of the intersections falling into the aggregating zones since total income is a so-called spatially extensive variable. This would be different for spatially intensive variables, which are independent of the spatial units used, such as income per head or percentages. In this case it is more meaningful to apply an average function when doing the aggregation instead of a sum function. To do so, one would only have to set the extensive parameter to FALSE. It has units, telling us the distance is 100,000 meters, not 100,000 inches, or any other measure of distance. It is returned as a matrix, even though the result only contains a single value. This second feature hints at another useful feature of st_distance(), its ability to return distance matrices between all combinations of features in objects x and y. This is illustrated in the command below, which finds the distances between the first three features in nz_height and the Otago and Canterbury regions of New Zealand represented by the object co. This section builds on Section 3.3, which highlights various basic methods for manipulating raster datasets, to demonstrate more advanced and explicitly spatial raster operations, and uses the objects elev and grain manually created in Section 3.3. For the reader’s convenience, these datasets can be also found in the spData package. The previous chapter (Section 3.3) demonstrated how to retrieve values associated with specific cell IDs or row and column combinations. Raster objects can also be extracted by location (coordinates) and other spatial objects. To use coordinates for subsetting, one can ‘translate’ the coordinates into a cell ID with the raster function cellFromXY(). An alternative is to use raster::extract() (be careful, there is also a function called extract() in the tidyverse) to extract values. Both methods are demonstrated below to find the value of the cell that covers a point located 0.1 units from the origin. Basically, this amounts to retrieving the values of the first raster (here: elev) falling within the extent of a second raster (here: clip). Figure 4.7: Subsetting raster values with the help of another raster (left). Raster mask (middle). Output of masking a raster (right). In the code chunk above, we have created a mask object called rmask with values randomly assigned to NA and TRUE. Next, we want to keep those values of elev which are TRUE in rmask. In other words, we want to mask elev with rmask. These operations are in fact Boolean local operations since we compare cell-wise two rasters. The next subsection explores these and related operations in more detail. Map algebra makes raster processing really fast. This is because raster datasets only implicitly store coordinates. To derive the coordinate of a specific cell, we have to calculate it using its matrix position and the raster resolution and origin. For the processing, however, the geographic position of a cell is barely relevant as long as we make sure that the cell position is still the same after the processing (one-to-one locational correspondence). Additionally, if two or more raster datasets share the same extent, projection and resolution, one could treat them as matrices for the processing. This is exactly what map algebra is doing in R. First, the raster package checks the headers of the rasters on which to perform any algebraic operation, and only if they are correspondent to each other, the processing goes on.18 And secondly, map algebra retains the so-called one-to-one locational correspondence. This is where it substantially differs from matrix algebra which changes positions when for example multiplying or dividing matrices. Focal or neighborhood operations. Most often the output cell value is the result of a 3 x 3 input cell block. Zonal operations are similar to focal operations, but the surrounding pixel grid on which new values are computed can have irregular sizes and shapes. Global or per-raster operations; that means the output cell derives its value potentially from one or several entire rasters. This typology classifies map algebra operations by the number/shape of cells used for each pixel processing step. For the sake of completeness, we should mention that raster operations can also be classified by discipline such as terrain, hydrological analysis or image classification. The following sections explain how each type of map algebra operations can be used, with reference to worked examples (also see vignette("Raster") for a technical description of map algebra). Local operations comprise all cell-by-cell operations in one or several layers. A good example is the classification of intervals of numeric values into groups such as grouping a digital elevation model into low (class 1), middle (class 2) and high elevations (class 3). Using the reclassify() command, we need first to construct a reclassification matrix, where the first column corresponds to the lower and the second column to the upper end of the class. The third column represents the new value for the specified ranges in column one and two. Here, we assign the raster values in the ranges 0–12, 12–24 and 24–36 are reclassified to take values 1, 2 and 3, respectively. We will perform several reclassifactions in Chapter 13. Instead of arithmetic operators, one can also use the calc() and overlay() functions. These functions are more efficient, hence, they are preferable in the presence of large raster datasets. Additionally, they allow you to directly store an output file. Predictive mapping is another interesting application of local raster operations. The response variable corresponds to measured or observed points in space, for example, species richness, the presence of landslides, tree disease or crop yield. Consequently, we can easily retrieve space- or airborne predictor variables from various rasters (elevation, pH, precipitation, temperature, landcover, soil class, etc.). Subsequently, we model our response as a function of our predictors using lm, glm, gam or a machine-learning technique. Spatial predictions on raster objects can therefore be made by applying estimated coefficients to the predictor raster values, and summing the output raster values (see Chapter 14). While local functions operate on one cell, though possibly from multiple layers, focal operations take into account a central cell and its neighbors. The neighborhood (also named kernel, filter or moving window) under consideration is typically of size 3-by-3 cells (that is the central cell and its eight surrounding neighbors), but can take on any other (not necessarily rectangular) shape as defined by the user. A focal operation applies an aggregation function to all cells within the specified neighborhood, uses the corresponding output as the new value for the the central cell, and moves on to the next central cell (Figure 4.8). Other names for this operation are spatial filtering and convolution (Burrough, McDonnell, and Lloyd 2015). In R, we can use the focal() function to perform spatial filtering. We define the shape of the moving window with a matrix whose values correspond to weights (see w parameter in the code chunk below). Secondly, the fun parameter lets us specify the function we wish to apply to this neighborhood. Here, we choose the minimum, but any other summary function, including sum(), mean(), or var() can be used. Figure 4.8: Input raster (left) and resulting output raster (right) due to a focal operation - finding the minimum value in 3-by-3 moving windows. We can quickly check if the output meets our expectations. In our example, the minimum value has to be always the upper left corner of the moving window (remember we have created the input raster by row-wise incrementing the cell values by one starting at the upper left corner). In this example, the weighting matrix consists only of 1s, meaning each cell has the same weight on the output, but this can be changed. Focal functions or filters play a dominant role in image processing. Low-pass or smoothing filters use the mean function to remove extremes. In the case of categorical data, we can replace the mean with the mode, which is the most common value. By contrast, high-pass filters accentuate features. The line detection Laplace and Sobel filters might serve as an example here. Check the focal() help page for how to use them in R (this will also be used in the excercises at the end of this chapter). Terrain processing, the calculation of topographic characteristics such as slope, aspect and flow directions, relies on focal functions. terrain() can be used to calculate these metrics, although some terrain algorithms, including the Zevenbergen and Thorne method to compute slope, are not implemented in this raster function. Many other algorithms — including curvatures, contributing areas and wetness indices — are implemented in open source desktop geographic information system (GIS) software. Chapter 9 shows how to access such GIS functionality from within R.
Zonal operations are similar to focal operations. The difference is that zonal filters can take on any shape instead of a predefined rectangular window. Our grain size raster is a good example (Figure 3.2) because the different grain sizes are spread in an irregular fashion throughout the raster. To find the mean elevation for each grain size class, we can use the zonal() command. This kind of operation is also known as zonal statistics in the GIS world. This returns the statistics for each category, here the mean altitude for each grain size class, and can be added to the attribute table of the ratified raster (see previous chapter). Global operations are a special case of zonal operations with the entire raster dataset representing a single zone. The most common global operations are descriptive statistics for the entire raster dataset such as the minimum or maximum (see Section 3.3.2). Aside from that, global operations are also useful for the computation of distance and weight rasters. In the first case, one can calculate the distance from each cell to a specific target cell. For example, one might want to compute the distance to the nearest coast (see also raster::distance()). We might also want to consider topography, that means, we are not only interested in the pure distance but would like also to avoid the crossing of mountain ranges when going to the coast. To do so, we can weight the distance with elevation so that each additional altitudinal meter ‘prolongs’ the Euclidean distance. Visibility and viewshed computations also belong to the family of global operations (in the exercises of Chapter 9, you will compute a viewshed raster). Many map algebra operations have a counterpart in vector processing (Liu and Mason 2009). Computing a distance raster (zonal operation) while only considering a maximum distance (logical focal operation) is the equivalent to a vector buffer operation (Section 5.2.5). Reclassifying raster data (either local or zonal function depending on the input) is equivalent to dissolving vector data (Section 4.2.3). Overlaying two rasters (local operation), where one contains NULL or NA values representing a mask, is similar to vector clipping (Section 5.2.5). Quite similar to spatial clipping is intersecting two layers (Section 4.2.1). 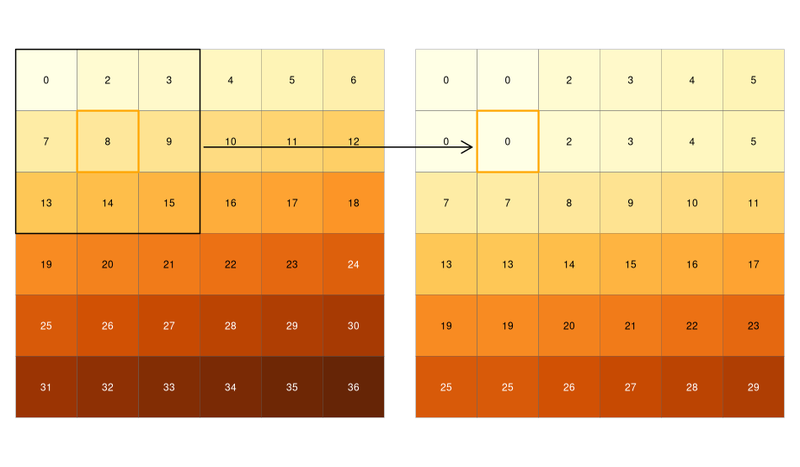 The difference is that these two layers (vector or raster) simply share an overlapping area (see Figure 5.8 for an example). However, be careful with the wording. Sometimes the same words have slightly different meanings for raster and vector data models. Aggregating in the case of vector data refers to dissolving polygons, while it means increasing the resolution in the case of raster data. In fact, one could see dissolving or aggregating polygons as decreasing the resolution. However, zonal operations might be the better raster equivalent compared to changing the cell resolution. Zonal operations can dissolve the cells of one raster in accordance with the zones (categories) of another raster using an aggregation function (see above). Suppose we would like to compute the NDVI (see Section 4.3.3), and additionally want to compute terrain attributes from elevation data for observations within a study area. Such computations rely on remotely sensed information. The corresponding imagery is often divided into scenes covering a specific spatial extent. Frequently, a study area covers more than one scene. In these cases we would like to merge the scenes covered by our study area. In the easiest case, we can just merge these scenes, that is put them side by side. This is possible with digital elevation data (SRTM, ASTER). In the following code chunk we first download the SRTM elevation data for Austria and Switzerland (for the country codes, see the raster function ccodes()). In a second step, we merge the two rasters into one. Raster’s merge() command combines two images, and in case they overlap, it uses the value of the first raster. You can do exactly the same with gdalUtils::mosaic_rasters() which is faster, and therefore recommended if you have to merge a multitude of large rasters stored on disk. The merging approach is of little use when the overlapping values do not correspond to each other. This is frequently the case when you want to combine spectral imagery from scenes that were taken on different dates. The merge() command will still work but you will see a clear border in the resulting image. The mosaic() command lets you define a function for the overlapping area. For instance, we could compute the mean value. This might smooth the clear border in the merged result but it will most likely not make it disappear. To do so, we need a more advanced approach. Remote sensing scientists frequently apply histogram matching or use regression techniques to align the values of the first image with those of the second image. The packages landsat (histmatch(), relnorm(), PIF()), satellite (calcHistMatch()) and RStoolbox (histMatch(), pifMatch()) provide the corresponding functions. For a more detailed introduction on how to use R for remote sensing, we refer the reader to Wegmann, Leutner, and Dech (2016). It was established in Section 4.2 that Canterbury was the region of New Zealand containing most of the 100 highest points in the country. How many of these high points does the Canterbury region contain? Which region has the second highest number of nz_height points in, and how many does it have? Generalizing the question to all regions: how many of New Zealand’s 16 regions contain points which belong to the top 100 highest points in the country? Which regions? Bonus: create a table listing these regions in order of the number of points and their name. Use data(dem, package = "RQGIS"), and reclassify the elevation in three classes: low, medium and high. Secondly, attach the NDVI raster (data(ndvi, package = "RQGIS")) and compute the mean NDVI and the mean elevation for each altitudinal class. Apply a line detection filter to raster(system.file("external/rlogo.grd", package = "raster")). Plot the result. Hint: Read ?raster::focal(). Calculate the NDVI of a Landsat image. Use the Landsat image provided by the spDataLarge package (system.file("raster/landsat.tif", package="spDataLarge")). A StackOverflow post shows how to compute distances to the nearest coastline using raster::distance(). Retrieve a digital elevation model of Spain, and compute a raster which represents distances to the coast across the country (hint: use getData()). Second, use a simple approach to weight the distance raster with elevation (other weighting approaches are possible, include flow direction and steepness); every 100 altitudinal meters should increase the distance to the coast by 10 km. Finally, compute the difference between the raster using the Euclidean distance and the raster weighted by elevation. Note: it may be wise to increase the cell size of the input raster to reduce compute time during this operation. Qiu, Fang, Caiyun Zhang, and Yuhong Zhou. 2012. “The Development of an Areal Interpolation ArcGIS Extension and a Comparative Study.” GIScience & Remote Sensing 49 (5): 644–63. https://doi.org/10.2747/1548-1603.49.5.644. Tobler, Waldo R. 1979. “Smooth Pycnophylactic Interpolation for Geographical Regions.” Journal of the American Statistical Association 74 (367): 519–30. https://doi.org/10.1080/01621459.1979.10481647. Tomlin, C. Dana. 1990. Geographic Information Systems and Cartographic Modeling. Englewood Cliffs, N.J: Prentice Hall. Burrough, P. A., Rachael McDonnell, and Christopher D. Lloyd. 2015. Principles of Geographical Information Systems. Third. Oxford, New York: Oxford University Press. Liu, Jian-Guo, and Philippa J. Mason. 2009. Essential Image Processing and GIS for Remote Sensing. Chichester, West Sussex, UK, Hoboken, NJ: Wiley-Blackwell. Wegmann, Martin, Benjamin Leutner, and Stefan Dech, eds. 2016. Remote Sensing and GIS for Ecologists: Using Open Source Software. Data in the Wild. Exeter: Pelagic Publishing.